A “Magnet Warrior” Deck that makes use of “Super Team Buddy Force Unite!” from “Extra Pack 2018”. 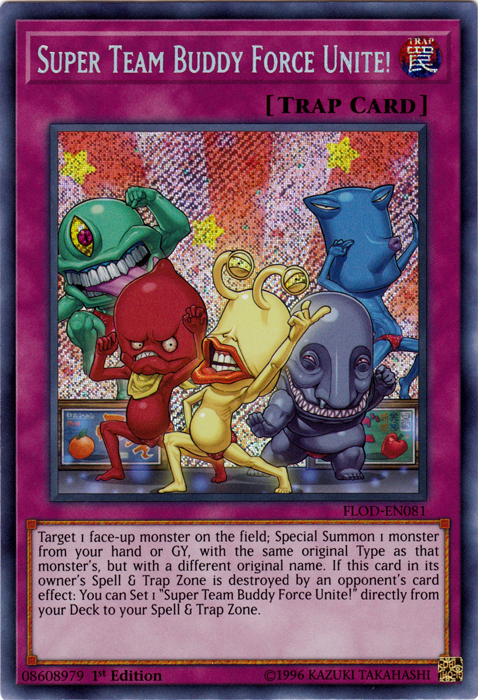 With the first effect of “Super Team Buddy Force Unite!”, you can do things like use the first effect of “Beta the Electromagnet Warrior” to add a monster to your hand when it’s Special Summoned, or use the first effect of “Delta the Magnet Warrior” to send a monster to the GY, allowing you to assemble the monsters used to bring out “Berserkion the Electromagna Warrior”. “Berserkion the Electromagna Warrior” can attack “Dogoran, the Mad Flame Kaiju” that was Special Summoned to your opponent’s field (that has the same attack), and destroy it by battle, you can Special Summon 3 of your banished “Magnet Warriors” with its second effect. 3 Super Team Buddy Force Unite!